Griff is right. 5000 series is softer than 6000 series. Two things I would try is a single flute (O flute) upcut carbide end mill and slow your feedrate down to 30 or 40 ipm. Keep your cuts light at .01 doc. Also, maybe get rid of that slot cut and try a pocket cut. If 1/4 end mill is a problem then step it down to 1/8. I’m not speaking from experience because I’ve never cut 5000 series before. I might be full of sh%t but the above is what I would try if I was doing it. Cut the feed rate in half, and try that. Set gwizard to “conservative” or “finish” (depends on the version), and you’ll see a much slower feed. It’s not melting, it’s work hardening on recut chips. A little bit probably started on the first slot, doesn’t take much to lead to more. Once it starts, it happens in seconds, and then it’s just pushing aluminum around, which makes it worse. Two issues that are CRITICAL to cutting aluminum. Speed and feeds - unlike wood, if you get this wrong, the flutes pack full of aluminum (the “welding” or “melting” you see. It’s not, it’s work hardened and really jammed in there. You can clean it out with a little effort and a pick. You must be extremely careful about recutting chips - aluminum work hardens, and breaks endmills with runout in no time. A couple chips jammed in there rapidly turn into lots more. Use an air blast or a dust boot to get the chips out of the cut. A little lubrication helps too. I prefer a tiny bit of alcohol, others prefer wd-40 or a real cutting oil. Use a HSS tool - I think they work better than carbide on aluminum. They are sharper than carbide tools. Others prefer Zn coatings on carbide. Do what works for you. In my experience cheap carbide tools don’t work with aluminum. Those 10 for $10 end mills from Amazon? Nope. Fine on wood, not on aluminum. You don’t necessarily need to spend $50 on a tool, but if it’s less than $10, you’re likely to have trouble. I’ve got a few I got for $10-15 that work fine. Anything works in wood, aluminum is way more picky. Single flute tools are fantastic - they are built for exactly this application - single flute means LOTS of room for chips in the flute. Lots of flutes, no room. You can clean it out with a little effort and a pick. Purple degreaser does the job. I switched to the 3/16" single flute HSS tool. Used 30ipm, 17500RPM, & used Pocketing instead. Success! It still might not be dialed in where it should be, but it sounds decent & the cut is nice. Chips aren’t building up in the slot like they did with the 1/4" tool (& I get what you guys are saying about the importance of keeping chips out of there). I have a dust boot but I have it off so I can watch these first cuts. Once I know that things are working as they should, I may use it. The material is my ‘customer’s’ - my employer, who I’m cutting parts for. For now I’m stuck using the 5052 that they stock, but as I get into this I might have them get me something more machinable. I know everybody says this… this is nothing special compared to some of the stuff you guys do, but here’s my first aluminum part, done with your help. The mark near the top end of the right slot is where the 1/4" bit gave up. I’ll clean it up a little better but it’ll get powder coated & won’t be an issue. when pocketing these slots, I stayed with Fusion’s 2 degree ramp down between levels. It resulted in about an inch of ‘ramp’ and it chattered a little during that. Maybe I just need to slow down the feedrate there, but is there a better strategy for ramping down? A good part is a good part! Nice work sticking with it. All these guys gave great info and Mike is on the money. When full width slotting it wouldn’t hurt knocking that ramp down to 1 degree also its very important to check your lead ins and outs to make sure its not jamming into a wall before/after the cut. Also with Fusion its very easy to figure out the right cutting parameters if you learn to figure out what kinds of chiploads your machine likes. Oh and you would be surprised how well a carbide single flute will cut at much higher rpm. And an 1/8 HSS SF can take lots of rpm and a nice cut if your depth requirements aren’t super high. Rule of thumb is try to not run under a 0.001 chipload and when running adaptive strategies you need to figure in chip thinning. The only aluminium I could get locally at a reasonable price was 5083, which I’d imagine is quite similar. My first few projects with it were complete failures, taking super fine cuts at low rpms. Then I got some awesome tips from this thread Lets share some tool paths - 3d Aluminium machining and since then have had nothing but success! the 0.001" (or 0.03mm) chipload is key - to get this I run a 6mm 2 Flute carbide endmill at 24000RPM, 1500mm/min feed, 1.2mm optimal load, 2mm DOC. I cut 5083 with these settings, on a completely stock SO3. Aluminum - I think the stepdown is a bit much right? I’m no pro, but I have learned when cutting Alu. with deep grooves it’s better to have the bit cutting on one side so chips can clear and friction is lower. 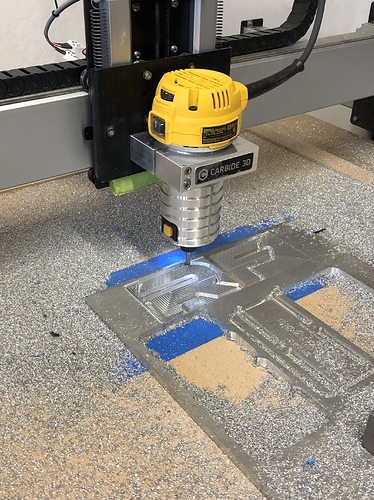 If I’m using a .250 bit, I’ll cut a .300 slot and have the router make two passes. Yes, it takes longer, but is runs much cooler and quieter. My two cents. … a quick thanks for the help I got here. It was a productive weekend - I cut all of my aluminum parts (and after working out cutting parameters, it cut beautifully). 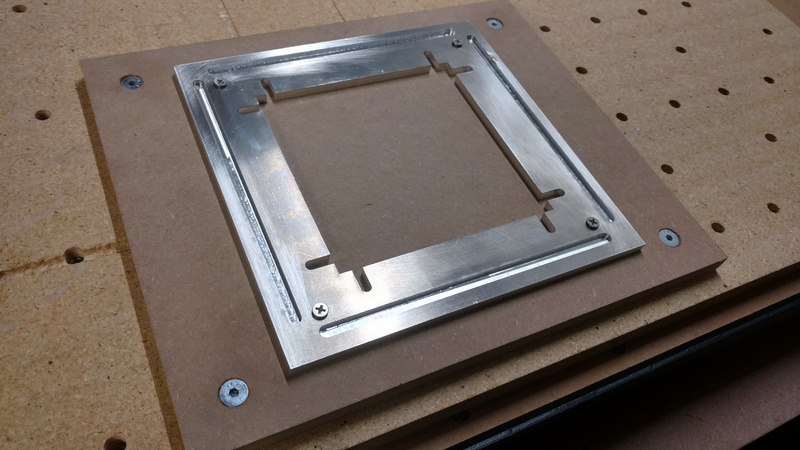 I also cut fixtures for two aluminum parts, some acrylic parts and some polycarbonate parts. Especially cool is that the same 3/16" HSS single flute bit works great on all of it. I love that probably 75% of the work that I do will be with the same bit. It makes things really easy. 1 - I got the arc error that’s apparently fairly common in CM. I downloaded the new Fusion post that fixes it, and it worked, but I also see that the CM beta deals with it. Is the beta stable, and is there any good reason to use it, or not use it? 2 - I’m using Carbide’s probe in CM. It looks like I’m stuck with the stock mills they list in probing, none of which are 3/16". Are there any hacks or creative workarounds for that? Hey Brian, just for clarity and documentation, would you post exactly what bits you used successfully and the feeds and speeds at which you ran them? Plus, the operations would help (adaptive or pocketing?). Thanks! 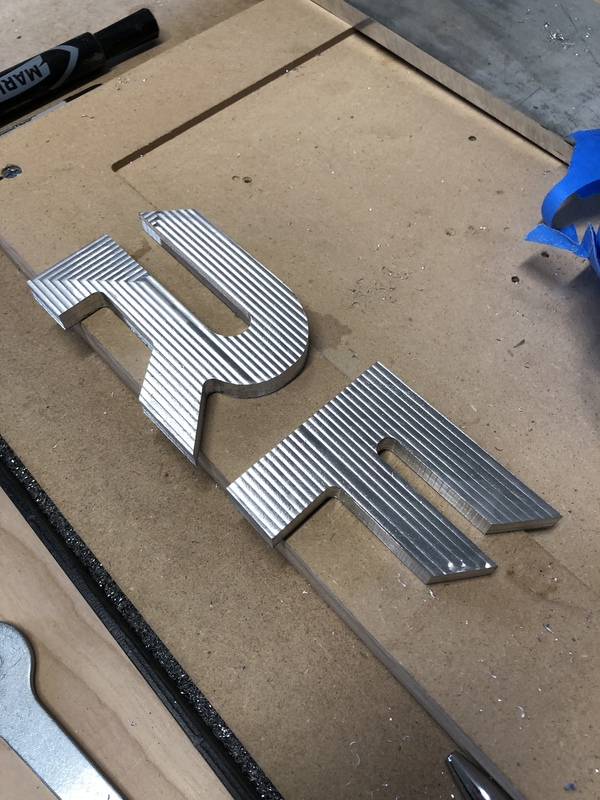 I want to do some more aluminum later this month and would love to try what you’ve tried and see how it works. I used Fusion’s 2D Pocketing to put a .250" wide x .125" deep slot in 5052 aluminum plate. 21000RPM, 38ipm, .032 doc. Roughing only - no finish pass was necessary. Dry cut. I tried using Adaptive at first but it wouldn’t give me a toolpath, which I assume has something to do with the diameter of the tool vs. the width of the slot. I feel like I could’ve tweaked things & shortened run time, but I had a bunch of parts to make on a deadline so once I got something that worked, I stuck with it. Are there any hacks or creative workarounds for that? Send the probing commands through the MDI. Or use a different sender. I am impressed you can run a 2mm stepdown. I tried with my 3/16" 2 flute bit and my 1/8" 2 flute bit to test the limits of their adaptive and when I tried to go too deep, the cuts started not being very clean on top. Like if you stopped the adaptive partway, there was material on the top of the stepdown that was rolled over like a burl on top. I could only get around a ~0.025" stepdown to work. This was in 6061.
without a decent breakdown of speeds and feeds/setup/etc it would be a guess as to which specific issue is at fault. Have you got the exact speeds and feeds you were using? I honestly haven’t used anything smaller than a 6mm endmill. Read through the link I posted a few replies up, @Vince.Fab and others gave some awesome advice regarding speeds and feeds. I have found that when doing adaptive toolpaths the optimal load has way more impact than DOC. I’d imagine even more of an impact with a smaller diameter endmill. I think I could push a little harder but as Brian said, I found something that works and stuck with it. I have trammed my machine and surfaced my wasteboard. I use double sided tape for workholding coupled with some clamps. Calculating chip thinning is very important when using small adaptive stepovers.